Reading this WAG Guide to Nutrition might feel like when you started learning more about healthy eating or exercise. Overwhelming and tricky at the get-go but stick with it... it will be worth it in the end! Give this guide a good read through without stopping. You’ll get the general picture and then can come back to it again with fresh eyes, ready to dive in and apply it to your goals and your life. Before we talk about macronutrients, aka “macros”, we have to first talk about calories. A calorie is the energy it takes your body to raise 1 gram of water by 1 degree Celsius. For those of you new to the world of nutrition, it’s easier to think of a calorie as a measurement of the energy we need to fuel our bodies. Chances are that you, like so many of us, have “counted calories” before. This calorie number you set for yourself could have come from a Google search, a book you grabbed at the library, a nutritionist or a one-size-fits-all program. But, no matter what “counting calories” gave you a limited number of calories to consume each day. Your daily caloric benchmark was set and you did your best to reach it without coming up short or going over. While you may have reached your goal at first, it may not have lead to sustainable, feel-good-all-over results. The simple calories in, calories out equation tells us that if you eat less calories than you burn you will drop weight. It’s true, but there’s more to our bodies than energy in and energy out. By eating the right kinds of calories (yep, there are different kinds!) you will not only get amazing results but you'll also learn more about your nutrition, body, and mindset than you thought possible. Calories are a great place to start, but looking beyond just calories is the key to reaching your individual goals. Building muscle, having energy throughout the entire day, feeling fueled and strong for workouts, and finally getting rid of any anxiety or guilt around food are just a few of the many amazing things our members are accomplishing every single day. Familiar with their lifestyle and understands their needs. Has experience helping people achieve similar goals to theirs. Is most likely to bond with them one-on-one so they actually start taking action. From there, the coach creates an individualized macronutrient plan for the member. They teach them how to stick to it and help them adjust the plan when life calls for it. Ready to meet your coach and begin your transformation today? There are 4 calories in every gram of carbohydrate, 4 calories in every gram of protein and 9 calories in every gram of fat. Like we said above, each macronutrient plays a specific role in your body. We need to look beyond calories so we don’t miss out on some of the things that are beneficial for our overall health, wellness and performance. Let’s dive into the three big players: Protein, Carbohydrates and Fats. every part of your body..."
Protein keeps your body healthy, strong and in a constant state of repair and renewal so you can bounce back from any tough physical challenge thrown your way. Not all protein is created equal. Identifying which sources are lean enough to easily work into your macros every day and which should probably be eaten in moderation can be confusing. 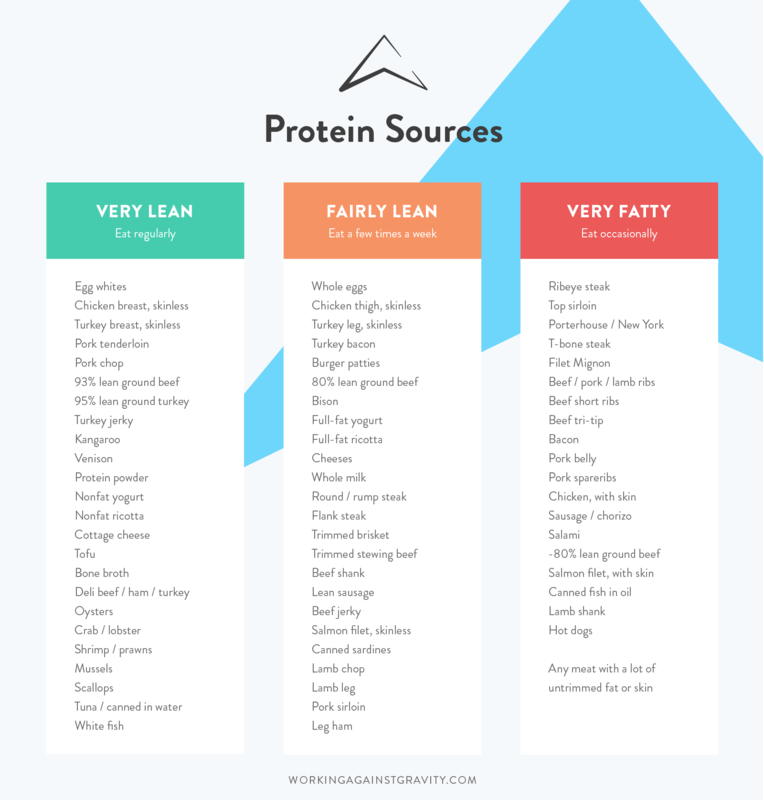 Check out this list of protein sources categorized from very lean to very fatty. Meat isn’t the only place you will find protein. Tons of delicious, high quality protein comes from plant-based proteins. We wrote this blog article all about plant-based protein sources. Relying less on animal based proteins and more on vegetables will provide the added benefit of a higher volume diet with more micronutrients (aka vitamins and minerals). Protein can also be found in dairy products like milk, yogurt and cheese! Just like vegetables, dairy products are full of some really important micronutrients like calcium, vitamin D, phosphorus, potassium, magnesium, vitamins A, B12 and riboflavin. Some dairy products (like yogurt!) are also full of probiotics which support good gut health. Why not try some protein for dessert? Whey protein is perfect for after a workout because it is quick-digesting. Casein protein is slower digesting and is more beneficial before a longer fasting period (like right before bed). Protein supplements are fabulous if they are used in the right circumstances. They can be a great way to quickly and conveniently hit your protein target, but they should not be relied on for all of your protein. If you’re finding that you’re hungry between meals it could be because you’re drinking your protein instead of eating it. There is something to be said for chewing and swallowing your food! Always have SOMETHING in the house that is exclusively protein like egg whites, whey or tuna. If you have a hard time hitting your protein, get a head start by aiming to hit a third of your protein at breakfast. If your protein target sounds overwhelming, divide it by the number of meals/snacks you're planning on having each day. If you are low on protein you can add egg whites to almost anything to increase protein intake (both in liquid form and tiny pieces when hard boiled). Mix whey protein in with iced or hot coffee for a rich and protein packed drink - trust us, it is delicious! and muscles feeling strong and fresh!" When you’re training, carbs are the macronutrient that is most readily available for your body. Carbohydrates replenish your depleted glycogen stores after a hard workout. This supports better performance and recovery for athletes involved in high-intensity training. When most people hear carbs they think pasta, bagels, bread and cookies. The truth is carbs are found in many more places than that. Double check sauce labels for added sugars. You can save yourself over half the carbs by choosing unsweetened options for things like tomato sauce or applesauce. Dietary fiber is a complex form of carbohydrates. There are two types of fiber soluble fiber and insoluble fiber. They are differntiated by their structure and the role they play in your body. Soluble fiber creates sticky, jelly-like substances in your body. It is soluble in water (it combines with water)and helps to slow the digestion and absorption of your food, particularly carbohydrates.That’s important for regulating blood sugar levels and keeping you from experiencing that no-good carb crash. Soluble fiber helps lower blood cholesterol levels too, which is great for your heart! Lastly, we really love soluble fiber, because when you’re in a caloric deficit, it keeps you feeling full and ensures you’re getting the most out of your food. Insoluble fiber does not combine with water. That means it helps bulk up stool volume, speeds up the digestion of your food and aids in a healthy digestive system. Insoluble fibers are found in the cell walls of plants so vegetables are a great bet when trying to up your insoluble fiber intake. Insoluble fiber is also found in whole grains. Both play a vital role in gut health, disease prevention and weight maintenance so finding a balance between the two is crucial. A general guideline for fiber intake is around 10-15 grams per 1,000 calories. If you focus on consuming fiber through mostly whole foods you will naturally find a great balance. High-fiber foods also tend to be chock-full of micronutrients (think vitamins and minerals) so it is associated with a well balanced diet. If you get sick of eating the same veggies over and over again, check out these 8 Creative and Delicious Ways to Enjoy Vegetables. Be adventurous and switch up vegetables from week to week – variety is the spice of life! Add vegetables to your snacks to get in a bit more fiber throughout your day! As humans, we are evolutionarily hardwired consume high-fat foods first, so we know this one won’t take much convincing. Fats give us the most caloric bang for our buck (remember, 9 calories per gram) and back in the “caveman days”– when we never knew when our next meal would be – this was really important (see The Hungry Brain by Stephan Guyenet for more on this). After the industrial revolution and Amazon Pantry, worrying about where your next meal will come from isn’t so much of an issue anymore. Now the issue is that our evolution hasn’t caught up quite yet. We have to be careful when it comes to our fat intake because it is delicious and can improve the texture of most foods. Guacamole? olive oil? mayonnaise anyone? This makes fat much more tempting and easy to overdo. Not to mention most fats are invisible in a cooked dish (oil, butter) so you probably eat more than you think without realizing it. Fats insulate your body, protect your vital organs and assist with brain functionality. Fats facilitate the transportation and absorption of the fat soluble vitamins A, D, E and K.
The omega-3 fatty acids EPA and DHA support cardiovascular health, joint health and digestion. Fats slow down the digestion of your food which helps with satiety and keeps you fuller, longer! Where Can I Find Healthy Fat? Alcohol is not a macronutrient, but just like proteins, carbs and fats, alcohol has a specific caloric value for every gram consumed. There are 7 calories in every gram of pure alcohol. Alcohol has limited nutritional value and intake should reflect your personal goals. To drink or not to drink comes down to personal preference and we get it, sometimes relaxing and grabbing a drink with friends is in your goals and that is totally okay. Alcohol can bring people together and build connection, it helps people celebrate momentous occasions and allows some people to relax. It’s all about finding a balance and creating congruence between your actions and your goals. No matter what you decide, those calories need to be accounted for before you clink your glass. There are so many different things to consider when deciding if partaking in a drink aligns with your goals that you can read about here! At Working Against Gravity we track a lot of data to get a well rounded picture of what your lifestyle and results look like. Fiber, body weight, body composition, mood, energy, stress, hunger, behavior and habits are just a few of the many things we keep tabs on. Since alcohol doesn’t fall under any macros, but we still need to track its calories..., we can “pretend” calories from alcohol are either coming from carbs, fats or a combination of the two. We never take those calories from our protein allowance. Protein is just too important! We can’t trust the nutrition label of most alcoholic beverages because there is usually missing information. Let’s look at an example. Remember that every gram of carbs has 4 calories, every gram of protein has 4 calories and every gram of fat has 9 calories. If this beer has 5.8 grams of carbohydrates and .8 grams of protein, that would add up to 26.4 calories for the entire beer. But, the nutrition label says there are 103 calories. Where did the other 76.6 calories come from? To counteract this magic math, we do a bit of extra number crunching. To track your drink as carbs: Divide the total calories by 4. To track your drink as fats: Divide the total calories by 9. We also have this handy WAG Alcohol Calculator that does the math for you. This is especially helpful if you want to pull macros from a combination of carbs and fats. The WAG Alcohol Calculator is a sliding scale so you can easily split between carbs and fats. Our calculator app makes it easy! If you want to skip alcohol at an event but don’t want questions, order a soda water with lime — you can ask for 1 oz. of juice for added flavor without a ton of extra calories. 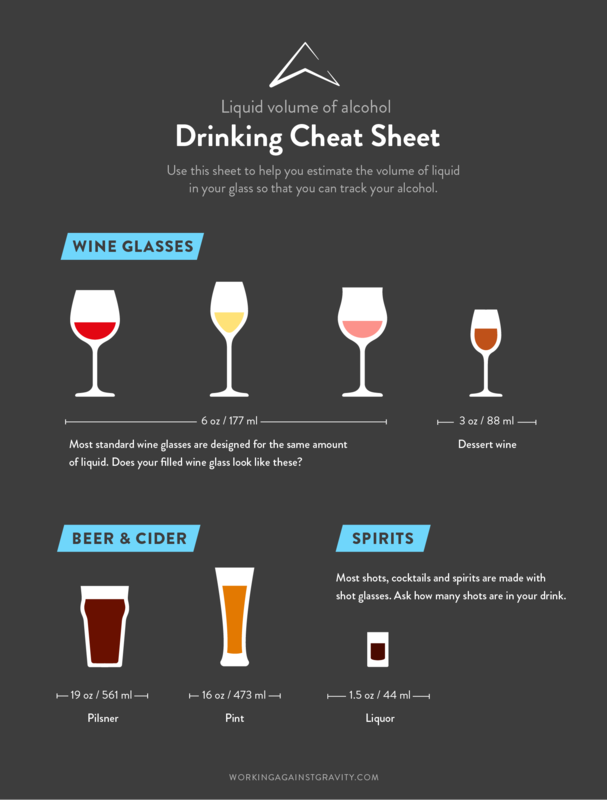 We also have this cheat sheet if you’re out for dinner, not certain on the size of your drink and need to eyeball it. It’s very important to remember that this is only accounting for the alcohol in your drink. Any mixers may have a macronutrient value that needs to be accounted for. Want more tips on how to enjoy a drink while hitting your macros? This Cocktail Party Survival Guide will be your new best friend! Learning about calories and macros is just the beginning. A WAG coach can determine exactly what YOUR program should look like. Join the team today! Vitamins are “essential,” which means that your body can’t make them fast enough to meet your daily needs. Vitamins are present in very small amounts in foods. It is important to get enough vitamins in your diet because they are needed for healthy body functions like growth and reproduction. Some vitamins you may have heard of are Vitamin C, D, E, A, K and the B Vitamins (1-6, 9 and 12). These vitamins all play specific roles in your body. Most minerals are also “essential” and need to be consumed through diet. Minerals can be broken down even further in to “macrominerals” and “microminerals” depending on their daily requirements. Minerals are present in very small amounts in foods. Some minerals you may have heard of are calcium, phosphorus, potassium, magnesium, iron, zinc, fluoride and many more! Vitamins and minerals can be found in most foods but whole foods like fruits, vegetables, nuts, seeds and whole grains are great places to start. For more information on micronutrients check out our blog article, IIFYMicros!